The LEGOLAND Hotel is only about 100 steps away from the front entrance to LEGOLAND Florida Theme Park. A knight and a pirate stand guard over the entrance to the LEGOLAND Hotel entrance. The wall behind the check-in counter is covered with LEGO Minifigures. After they finish building, guests can display their creations for others to see in the hotel lobby. The castle in the lobby is so large it is taller than the lobby itself. Just like any other hotel, guests are greated in the morning with a newspaper at the door. Thousands of LEGO Minifigures parachute from the sky. A blast of confetti fills the sky and the LEGO dragon blows smoke at the LEGOLAND Hotel opening ceremony. Tons of confetti fills the sky at the LEGOLAND Hotel opening ceremony. Confetti filled the sky, a 15-foot-tall dragon blew smoke into the air and thousands of LEGO Minifigures parachuted to the ground on Friday morning to mark the official opening of the LEGOLAND Hotel in Winter Haven, Florida. The colorful five-story hotel, only about 100 steps from the entrance to the LEGOLAND Florida theme park, is specifically designed for children ages 2 to 12. A giant castle and pirate ship, both filled with LEGO bricks, sit in the hotel lobby where kids can play and build. And there is a massive pit full of LEGO bricks right near the check-in, perhaps a welcome distraction for kids while parents take care of the details before their stay. More than 2 million LEGO bricks were used in the more than 2,000 models throughout the hotel: dragons, knights, pirates and even LEGO staff members. Everything in the hotel, from the LEGO statues of bellhops and maids to the whoopee cushion next to the disco elevator, is right where kids can see them. Yes, you did just read the words “disco elevator.” Make sure to watch to the end of the video for that. Even the buffet at the Bricks Family Restaurant in the hotel is designed with children in mind. Adults barely noticed the chicken nuggets, macaroni and cheese and Jello served at kids' eye level. And kids hardly noticed the seared mahi mahi, pulled beef brisket and tiramisu served at a height more appropriate for grown-ups. The hotel rooms are decorated with four LEGO themes: Adventure, Kingdom, Pirates and LEGO Friends. The carpeting, wallpaper, shower curtains and beds all have LEGO prints with the various themes, and the rooms have LEGO models on the walls. For example, in Kingdom-themed rooms the walls are adorned with LEGO models of butterflies, dragonflies, spiders, crowns and a coat of arms. Each room has a treasure hunt for kids to find clues to open a chest filled with LEGO treasure for them to keep. Jones says the addition of the hotel turns the park into a complete resort destination. He says the hotel allows guests to plan their vacation around the LEGOLAND Florida Resort in advance, instead of merely adding the park as part of another trip. A stay at the LEGOLAND Hotel includes breakfast at the Bricks Family Restaurant, early admission to the LEGOLAND Florida theme park and nightly children’s entertainment. The LEGOLAND Florida Resort is about 45 minutes away from the Orlando theme parks. LEGOLAND provided lodging, tickets and merchandise to reporters at the grand opening of the LEGOLAND Hotel. Copyright 2018 WMFE. To see more, visit WMFE. 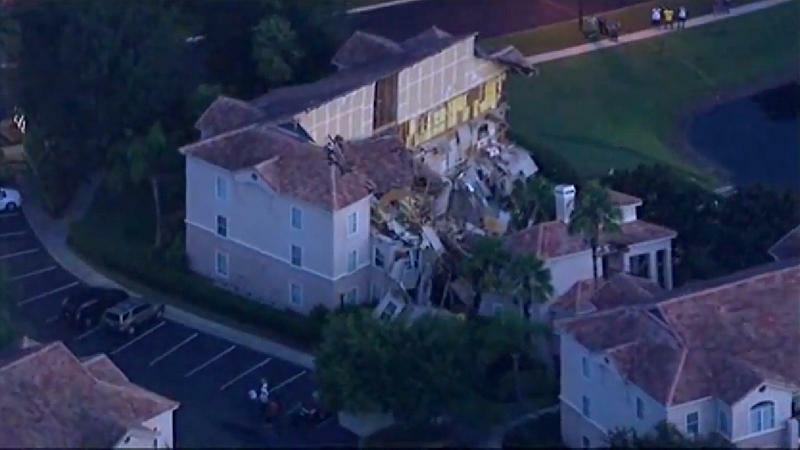 Vacationers staying in a luxury villa in central Florida awoke to creaking and crashing sounds Sunday night, as the three-story building they were staying in began to collapse. A large portion of the structure was pulled into a sinkhole at the Summer Bay Resort near Disney World. It seems the process was slow enough that it allowed everyone in the building to get out safely.